Great Idea. Great Design. But Will It Fly? You are here: Home / It's a Nerd's World / 30-Days to Dominate Twitter Experiment / Great Idea. Great Design. But Will It Fly? I’ve got this great idea. 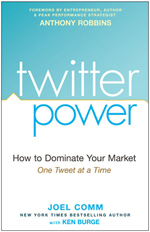 Joel Comm outlines a 30-day plan for “dominating Twitter” in his book Twitter Power (here’s the book review). Wouldn’t it offer a great experiment to actually follow his plan for thirty days, blog it live and see what happens. Well, that’s precisely what I intend to share with you. Does Joel Comm’s 30-day plan really work? Or, was it merely a hook his publisher wanted him to use to bait readers into buying the book? All those with the slightest bit of scientific curiosity will want to know. My prediction: I’m a skeptic. If I get 100 followers I’ll be happy but not impressed. If I get 1,000 followers I’ll be impressed but not sold. If I get 10,000 followers, not only will I be sold, but I’m sure Joel Comm will sell a heck of a lot more books (and much, much more).